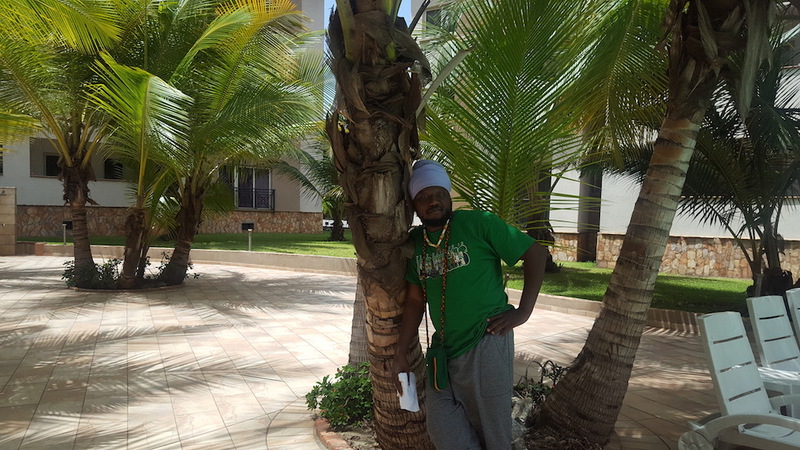 My interview with Blakk Rasta, Ghana’s most famous reggae star, has not started well. Who’d have thought a Ghanaian Rastafarian would actually turn up on time – at 9am on a Saturday? I certainly didn’t expect it… so I’d spent most of the night drinking in what I dimly recall was a red leather-lined cage in Twist, one of Accra’s best night clubs. But here he is, on time, standing outside his four-wheel drive, beside his manager Kweku Legacy, and Red Fire, another reggae artist. They look sprightly; they’re here to promote two things: his new album which is out the following week and the upcoming Kuchoko Roots Festival on La Boma beach on May 21. We go and sit under the palm trees by the swimming pool in the middle of a plush apartment complex in the Airport neighbourhood of Accra. Kweku – all flat cap and toothy grin – films the luxury oasis, sizing it up for a possible video shoot. There are some middle-aged women doing an aqua-aerobics class who look worried by these unexpected visitors. These ladies don’t realise they’re in the presence of Blakk Rasta, a man who’s met Obama (‘He was wonderful, he was irie’); has taught African history at the University of Central Missouri; and has apparently never smoked marijuana. ‘I’ve never smoked weed. It doesn’t sit well with my body. I don’t condemn it, I have a lot of brethren who smoke,’ Blakk Rasta tells me, slightly red-eyed, but so deadpan I’m not sure whether to believe him. ‘The fact that I don’t smoke doesn’t mean I don’t use it for other things,’ he clarifies. Foregoing a toke hasn’t stopped him getting into trouble. In 2015, Abubakar Ahmed (his real name) was hauled in front of parliament for claiming that 80 per cent of politicians smoke weed. He apologised, just about. I was asking the government to grow marijuana in huge state farms. Thanks for exposing those the criminal MPs who want to be called honourables @JonBenjamin19 . Laughable! I doff my herbal hat for you, sir. 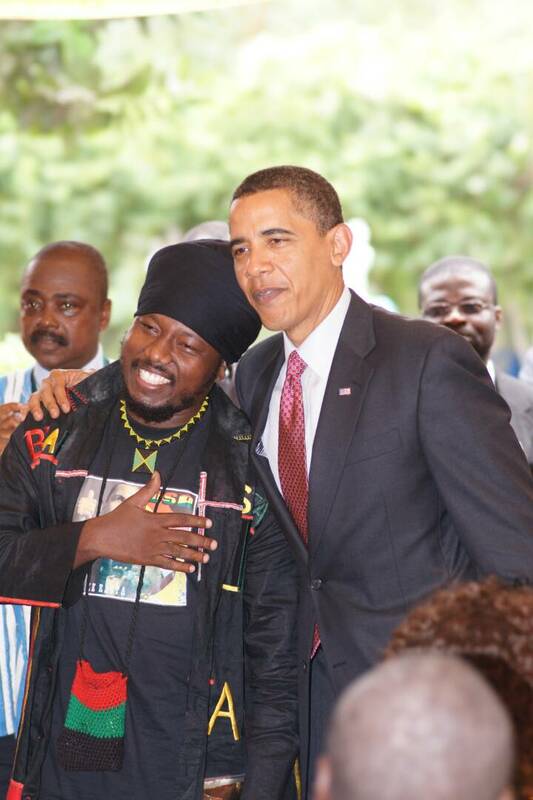 Blakk Rasta has always thought a little differently. He used his student loan when he was studying science and technology at the University of Kumasi in the late nineties to record and launch his first album. At that time, everyone was listening to Highlife. But after meeting some Rastas on campus, and inspired by the Nigerian artist Ras Kimono whose accent he could understand better than Jamaican patois, he started playing reggae. Blakk Rasta carved out his sound with his second album More Fyah in 2002. Now recording and playing with a live band, he felt free to use traditional instruments like talking drums, wooden xylophones and reed flutes to give his music a more African sound. He even used his locks to beat the djembe, a traditional drum, while performing in the Ivory Coast. Like Madinke reggae, which was pioneered by Alpha Blondy, he developed it into a whole new genre. If Bob Marley were alive today, I believe he would be doing Kuchoko. Reggae has always been innovative, he says, while pointing out that one of the ladies who was balancing awkwardly on a float in the pool is now drinking a drink the same colour as her swimming suit. The current roster of Jamaican reggae stars doesn’t impress him, particularly when it comes to returning to the green lands of Africa. ‘A lot of it is just lip service. A lot of Jamaican artists will go to America and perform for US$1,000 but when they are invited to Africa, they want $20,000.’ Bob Marley, on the other hand, he goes on to remind me, went to Gabon in 1980 and in the same year played in a free concert for Zimbabwe’s Independence celebrations in the Rufaro Stadium in Harare. He also admires legends like Mutabaruka, DYCR, Linton Kwesi Johnson, and Peter Tosh but also reggae’s current poster boy Chronixx. Africa is the hub; it’s the birthplace of music. He’s serving up new music to hungry fans now. His latest album Kuchoko Revolution has just been released on VP Records, a legendary reggae label who’ve also signed the Nigerian dancehall star Patoranking. ‘They are already thinking of putting this album in for the Grammys,’ he says.